DISPLAY TROLLEY. Functional and versatile display solution. 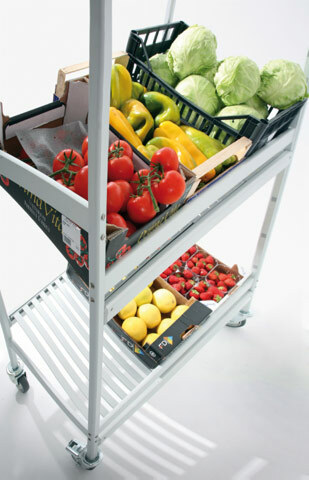 A trolley designed to display and store all manner of products. 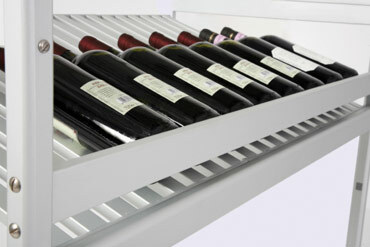 A practical, elegant system for putting crates of fruit and vegetables, wine bottles, bread baskets, trays of flowers etc. on best display. 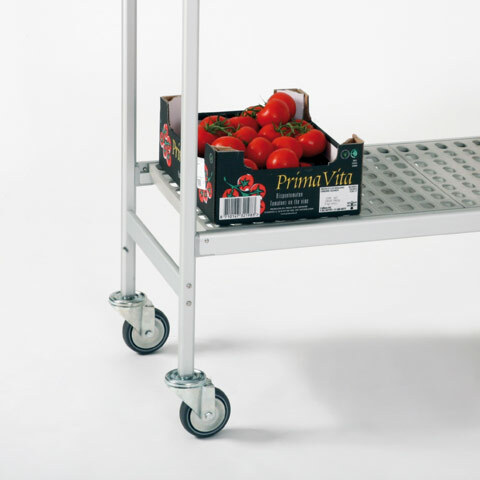 It comes in anodized aluminium with a choice of aluminium or polyethylene shelves and is characterized by its strength, stability, practicality and lasting durability. It features 4 galvanized steel locking swivel castors, which make it particularly safe and easy to handle even when carrying a full load. Quick and easy to assemble, it can be supplied in a wide range of sizes and can adapt to cater to any display need. MODULAR TROLLEY. Stable, practical handling. 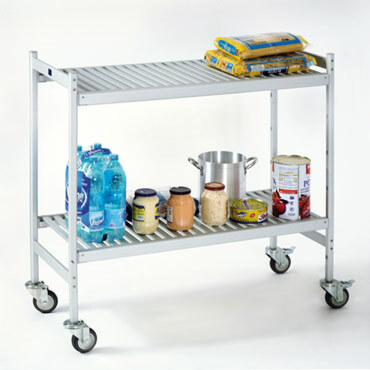 This trolley has been designed and manufactured to carry all manner of foodstuffs and other products from the unloading area to the storeroom. It comes in food-safe anodized aluminium and stands out for its excellent strength, stability and practicality. The galvanized steel locking swivel castors make it particularly safe and easy to handle even when carrying a full load. With an elegant design and quiet operation, it comes in an extensive range of standard sizes and has shelves made from anodized aluminium 20 microns thick or polyethylene, making this the optimal solution to meet the needs of numerous applications. Built to take heavy loads with minimal bending. A 1152 mm shelf has a 110 kg load capacity. 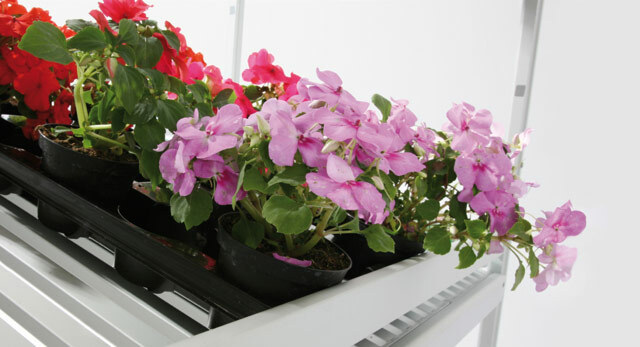 A practical, elegant system in a wide range of available sizes for saving space and putting crates of fruit and vegetables, wine bottles, bread baskets and trays of flowers on best display, while it lends itself to many other display solutions. 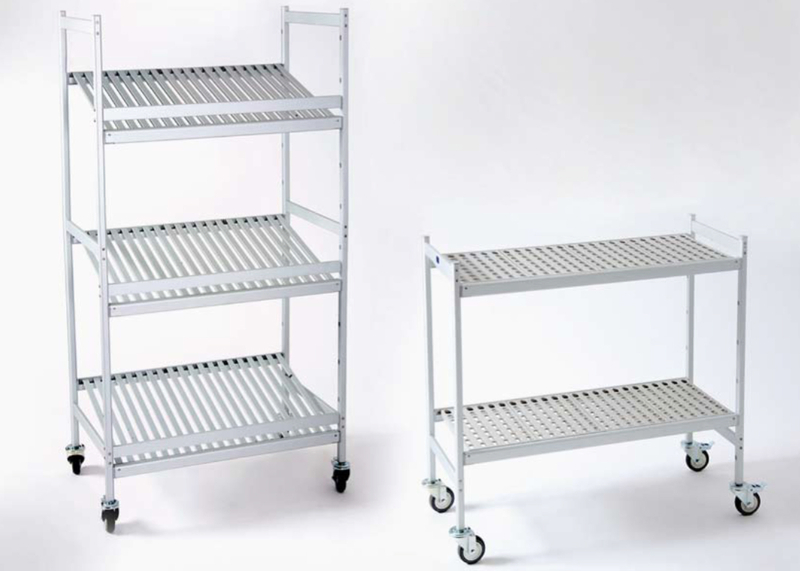 Shelves come in two versions – anodized aluminium 20 microns thick and polyethylene – and have a number of distinguishing traits: they are easy to remove, boast an elegant, modern design and are easy to clean, making them thoroughly hygienic and thus food safe. The galvanized steel locking swivel castors make it particularly safe, easy to handle and quiet even when carrying a full load.